Expanding on our previous post on “How to select a flooring system for your facility,” we will now look at how to select a specific epoxy flooring system for your facility using the same three factors: the type of facility, the budget and the current condition. But first, what exactly is an epoxy coating? Epoxy flooring is the most efficient way to enhance and maintain your work environment, while still providing a durable flooring system that is abrasion/impact resistant. This epoxy is also known as polymers and is made up of different materials based on the epoxy’s function. (“Polymer” come from the Greek words for many + part.) The coating’s main purpose is to protect the concrete it covers but has many other functions like line-striping and static-resistance. 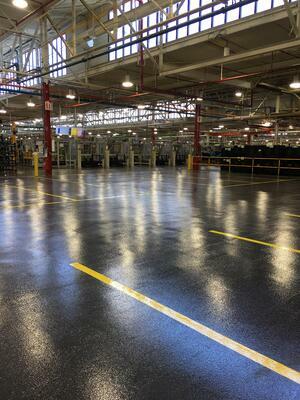 Our Rez-Stone epoxy coatings transform even the worst floors into a clean and safe work environment. Download our Rez-Stone Binder to help understand which floor system your company could use. From automotive companies to chemical manufacturers, epoxy floor systems can be tailored to fit almost any environment. First, you will need to determine how much traffic your floor will receive and what the area will be used for. For instance, in the automotive industry we normally install our general service epoxy flooring systems such as Rez-Stone 9220, 9334 and 9500. For off-aisles or light traffic areas, we recommend a coating system such as our Rez-Stone 9220 or 9334 systems. In aisle-ways or high traffic areas, the Rez-Stone 9500 ¼” thick trowel applied system offers great wear-ability, durability and impact resistance. For chemical manufacturers, the food and beverage industry, battery manufacturing or any company that may deal with aggressive chemicals or cleaning solutions, we would recommend one of our Rez-Stone novolac or urethane mortar systems. The Rez-Stone 9220-Nov, 9334-Nov, 9500-Nov and 9750 Urethane Modified Cement (UMC) systems offer a greater chemical and heat resistance compared to the standard 9220 and 9334 systems. They withstand excessive heat from the manufacturing process as well as the use of steam to clean the surface and offer additional chemical resistances. Understanding the current condition of your floors is key to knowing what sort of surface preparation is needed. If the concrete underneath is worn out and has many cracks, those need to be filled before starting. General service epoxy systems such as the Rez-Stone 9220, 9334 and 9500 systems are often used in the automotive industry due to the type of traffic, impact resistance and durability. They help keep your floor damage-free for longer and the coatings are not exposed to harsh chemicals or excessive heat from the manufacturing or cleaning processes. They offer great function and value without the more expensive price tags of the novolac or UMC systems. From small to large areas, these systems can be an excellent addition to any facility looking to upgrade their flooring. The novolac epoxy or urethane modified cement systems are often a requirement due to the conditions inside of the facility. Harsh chemicals and extreme heat exposure are two examples of where these systems exceed the performance of the general service epoxies. Referencing the systems above, there is a noticeable difference in the pricing between general service epoxies, novolac systems and urethane-based systems. In many instances, the budget is the driving factor for which flooring system is selected. A business is only going to want to spend as much as they have to, so by determining your type of facility and the current condition of the floor, we can help you find a system that fits into your budget. The type of facility, budget and current conditions are all relative to each other; meaning these are all factors that are part of the decision-making process. In many instances, one factor drives the other. We suggest starting with what needs to be done versus looking for what the prices are because flooring is not something to go cheap on. At the end of the day, the flooring professionals at Hoover Wells are here to help you make the most logical and sensible decision for your capital investment into your new floor. Download our presentation to know which floor system your company needs. From polishing your concrete to epoxy flooring the options are endless. Whichever option is selected, the experts at Hoover Wells can assist with the installation of your flooring needs. We also post articles one a week over all kinds of topics. Check out our posts and come back for new ones.